← Are You Gonna Eat That? My friend Joan had to put her son’s dog down over Thanksgiving, probably the hardest, saddest task in the whole wide world…and on a holiday. First to make the decision, then to have to go do it. I’ve been there, and it’s moment one never forgets. And of course you want to be there since that little, loyal creature was always there for you. But you may as well pull your heart out of your chest and leave it sputtering on the kitchen table. 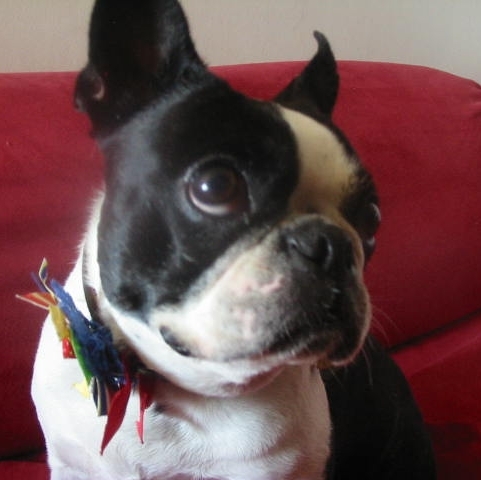 Lehigh Blake was a sweet, funny Boston Bulldog that always made me think of dice…black and white…with a little head like a cue ball. I’d see them in the morning, Joan patiently waiting as she sniffed and rolled along the hills and dales of Central Park. She was introduced to me way back when as her grandchild, something that made me laugh since, despite a tail and a couple of extra legs, was quite simply the truth. How lucky her son was, his mom was there to take her, knowing she was in such good hands….grace for any pet owner happy it’s being loved in their perpetual absence. The affection exchanged was very obvious….I’m there for you Gram, and I know you’re there for me. It’s always a risk to love something, anything….even if it’s a pair of shoes that without warning, might get caught in the rain. To open yourself up to a animal who knows no guile…no tricks of the trade except to accept you no matter what you bring to the table, despite this unfortunate downside, is well worth the pain you’ll reluctantly admit later, when you have to let them go. You get to do that for them…say…I love you so much I’ll release you from this…wishing when your time came…someone, compassionately, gently, would do the same for you. This entry was posted in animals, Love, New York City and tagged animal adoption, Boston Bull Dogs, dog lovers, enduring loss, putting an animal down. Bookmark the permalink. It is painful: we’ve all been there. But I tell myself it’s not a cause for sadness but for jealousy. I wish someone could put me down when my time comes but, failing a trip to Switzerland, I will have to lie and wait for death to release me. Yes, Susannah, it’s so hard to hold and comfort a beloved pet as it is put down, but I’ve always been there. And I know you would be, too. We all would be. It’s part of the deal. Maybe that is the reason I’m not much of a pet person. I don’t think I could let go so easily. That is really not the correct word. It isn’t easy – its heartbreaking. My turtle – Franklin – will probably outlive me. I just hope there is someone around to care for him! I’ve done this too often and it doesn’t get easier. Pets come with deep bonds. I lost my favorite cat and my favorite aunt in the same month many years ago. I mourned my cat much harder. For one, she was in my daily life and my aunt wasn’t. The second was that my aunt had Alzheimer’s and it was really a blessing for her. While my cat was ill (and it should have been a blessing for her too) I couldn’t get that message from my head to my heart. I know…such a familiar story. The heartbreak of losing an animal. My friend is so sad, though trying to hide it. It wasn’t one of my happier posts, but I wanted to write it for her. Thanks for reading, as always.